This unit is very compact which makes it easy to get into small areas - perfect for mold remediation in homes - able to handle up to a 30’ x 30’ x 10’ room! 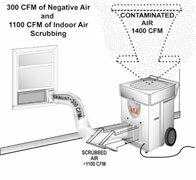 This is the contrcators Air Scrubber / Negative Air Machine. The 10” exhaust allows for easy ducting . 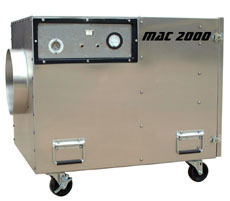 Variable speed control , from 400 - 700 cfm . This unit is for the contractor who is in need of a unit that can handle the big jobs . Filter placement that insures uninterrupted air flow and equal displacement of filtration . Can handle large areas like small homes - able to handle up to a 75’ x 75’ x 10’ area! Lock-in-place filter that eliminates by-pass of contaminated air. The 12” discharge allows for easy ducting . High capacity HEPA filter. Two speeds give you more options. The Guardian systems are the first portable air scrubbers designed specifically for the fire and water damage restoration industry. The Phoenix Guardian HEPA System can perform several critical air quality remediation functions simultaneously. The Phoenix Mini-Guardian HEPA System is the compact, variable air speed, version of our popular Phoenix Guardian HEPA System.